« Streetcar TDD Vote Passed! OK, so maybe you’re not a bona fide Mall Rat. In fact, maybe you have some strong biases against malls. No matter. Visiting a mall once in a while won’t kill you — especially if it’s 105 degrees in the shade. Let’s assume you’re a Metro rider. Take the Metro bus of your choice to Crown Center, arriving there by 1:00 pm any weekday. You can get there via any number of routes: Main Street MAX, 27, 54, 123, 142, 173, etc. At 1:05 (or thereabouts), board The JO’s Route 672-M (Midday) bus at the Crown Center Square, across from the fountain. (You can also board at 10th and Main at 12:58 pm.) Swipe your Metro transfer through the farebox, just as you do on a Metro bus, and settle in for a one-hour ride. You’ll find the JO bus to be clean and comfortable, and the driver courteous and helpful. After a sprint along I-35 you’ll go south on Roe through Roeland Park, west along Johnson Drive through Mission (take note of The JO’s new Mission Transit Center under construction at 4851 Johnson Drive), south on Metcalf past Downtown Overland Park, and pause at Metcalf South Shopping Center (where you could, if you wanted to, see a movie at Glenwood Arts Theater), and west on 95th Street to Oak Park Mall. 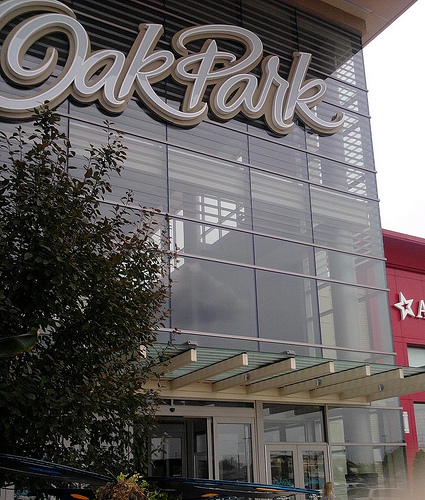 You’ll arrive at Oak Park Mall about 2:02. Once at OPM you can (1) Shop, (2) Window-shop, or (3) Eat at the food court or one of the other eateries in or near the mall. Eventually, even though you might not want to, you’ll need to go back home. Fortunately The JO has several buses that will take you back to Missouri. Route 670-L (South Johnson County Express) will get you back to Crown Center in practically no time at all: it leaves the OPM park-and-ride lot at 4:18, 4:49, 5:19, and 5:49, and the return trip takes about 30 minutes. (You can also return via Route 575, which takes you to Waldo or 75th and Troost.) Last buses back to Missouri are the 670 at 5:49 and the 575 at 5:50. After that, your coach has turned into a pumpkin, and you’ll have to call a friend or a taxi — or start walking. Note: You got to OPM on your Metro transfer. 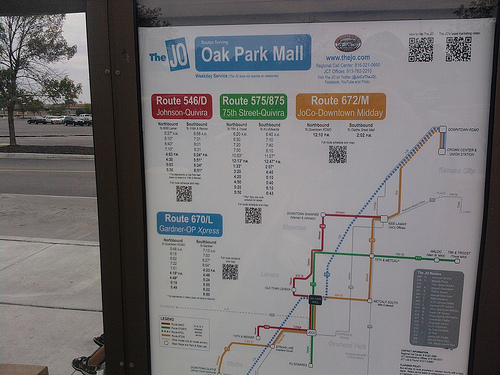 The JO accepts a Metro transfer, but not a Metro monthly pass or day pass. You’ll need to pay a regular fare to The JO to return. Regular fare is $2.00 for adults, $1.50 for seniors (with any ID that shows your date of birth). Kids 5 and under ride free, and kids 12 and under must be accompanied by an adult. If you don’t have a Metro monthly pass or day pass for your onward travel once you return to Missouri, be sure to tell your JO driver “I need a transfer to the Metro.” The Metro accepts The JO transfers. Easy, right? You’ll have kept cool for an afternoon while experiencing one of the region’s biggest shopping malls, and you’ll have become one of the relatively few transit riders in the region who can say that they’ve ridden The JO. So what’s keeping you? Give it a try and let us know what great fun you have! P.S. 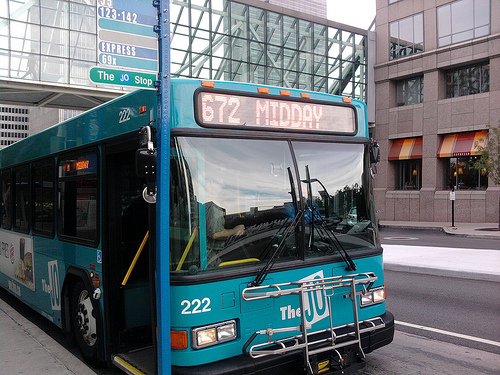 The 672-M Midday bus is on the Johnson County Transit list of proposed eliminations for 2013. This entry was posted on August 8, 2012 at 9:13 AM	and is filed under Action, Transit Adventures. Tagged: The JO. You can follow any responses to this entry through the RSS 2.0 feed. You can leave a response, or trackback from your own site.